Guyana’s Commissioner of Police, Seelall Persaud (centre). 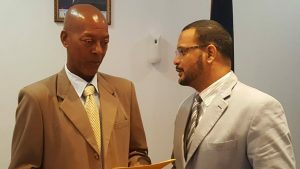 Suriname’s Assistant Police Commissioner, Guno Roosenhoff (left), Head of the GRA’s Customs and Trade Administration and Head of the Customs Anti-Narcotics Unit, James Singh. Guyanese police and customs on Tuesday handed over to their Surinamese counterparts information and intelligence on a wide range of criminal activities that will eventually pave the way for a crackdown on organised and other crimes in a timely manner. “We did share information. Among that information is trends, flow trends, organised criminal syndicates on both sides; wanted persons (on) both sides, missing person- and missing persons is significant when it comes to deal with trafficking in persons because they may be reported as a missing person in one country but in fact they may have been trafficked to another country,” Guyana’s Police Commissioner, Seelall Persaud told a news conference. The files about wanted persons, smuggling, missing persons and other types of organised crime were handed over to Assistant Police Commissioner, Guno Roosenhoff who headed a delegation of police, customs and other law enforcement agents to Guyana. “We are going to work things and we are going to ensure that when you go on operations, you have the right persons,” he told Demerara Waves Online News. The GRA’s Customs and Trade Administration handed over a file on the movement of vehicles to Suriname’s police. SHARING INFO AND INTEL: Commander of the Suriname Police Force’s Organised Crime Department, Assistant Commissioner Guno Roosenhoff (left) and Head of Guyana’s Customs Anti-Narcotics Unit, James Singh. 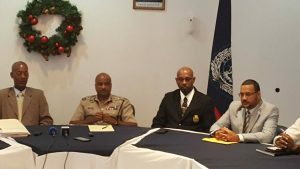 The Guyana Police Commissioner said the cooperation is expected to continue because “we find it to be very fruitful” that information could be shared directly with police, Customs and Trade Administration of the Guyana Revenue Authority (GRA) and the Customs Anti-Narcotics Unit. “Information is perishable! It makes no sense that you share it when it no longer becomes useful so sharing has to be timely,” Persaud said. He added that the unique collaboration between police in Berbice and Nickerie would continue. Persaud said the two sides began their latest round of official cooperation in April, 2016 when top police departmental heads established links with their Surinamese counterparts to explore ways of combating organised crime including piracy, trafficking in drugs, persons and the smuggling of goods across the border. Representatives of the Suriname Police Force also explored ways of adapting Guyana’s social crime prevention programme and the Association of Women Police.